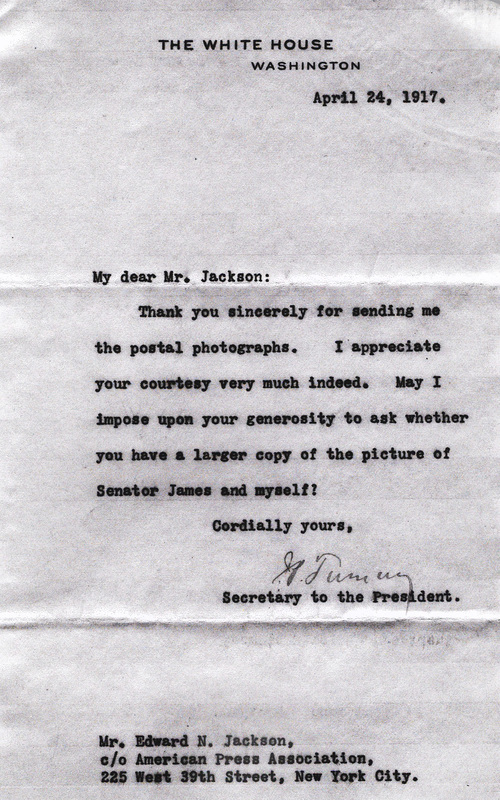 JP Tumulty writes to Edward N. Jackson for a larger copy of a Wilson portrait. Thank you sincerely for sending me the postal photographs. I appreciate your courtesy very much indeed. May I impose upon your generosity to ask whether you have a larger copy of the picture of Senator James and myself? 235 West 39th Street, New York City. 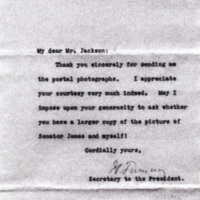 Tumulty, Joseph P. (Joseph Patrick), 1879-1954, “Joseph P. Tumulty to Edward N. Jackson,” 1917 April 24, T100050, Edward N. Jackson Photographs, Woodrow Wilson Presidential Library & Museum, Staunton, Virginia.